Industrial corridors along the Chicago River are underutilized. Vacant land, dying industry, and a declining manufacturing sector warrant a rethinking of the role of industrial corridors in one of America’s great post-industrial cities. Although the traditional heavy industrial corridors are shrinking, the vacancies provide the opportunity to insert a new, more sustainable, industry into the Chicago River landscape. What if the new industry could relate directly to the Chicago River? What if Chicago’s new industry was water itself? The City, situated on one of the largest fresh water bodies in the world, Lake Michigan, will redefine itself as the idea generator and production hub for sustainable freshwater management. The existing Pilsen Industrial Corridor will become home to Chicago’s first Water Institute devoted to research, training, and technological developments. The knowledge generated will spur the development of water industries and a local economy entirely based on water. 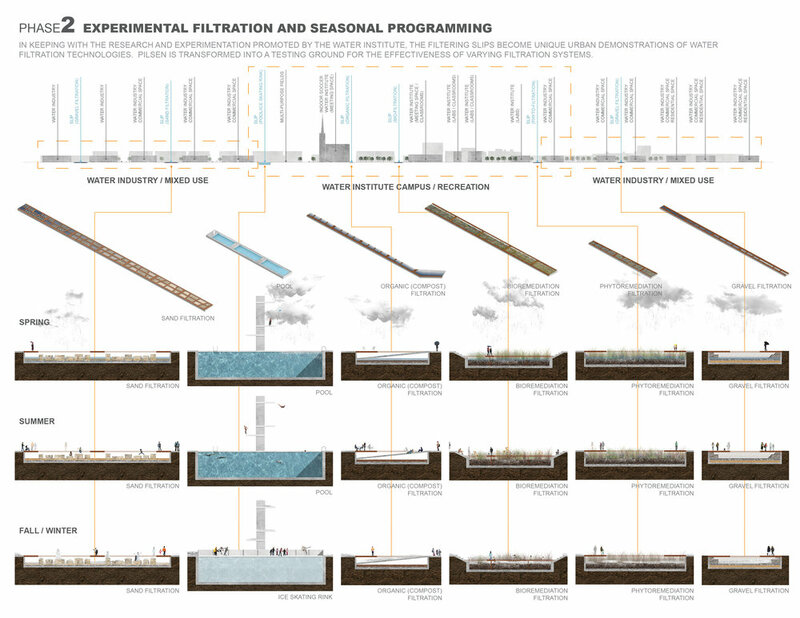 In addition, the landscape of Pilsen will become a performative hydrologic infrastructure in and of itself. 14 historic industrial slips that once allowed barge access into the corridor will be unearthed and used to collect, treat, and educate Chicagoan’s about stormwater management through experimental water filtration slips. With the reinvention of the Pilsen Industrial Corridor, Chicago will once again be connected globally through an industry along its river. 2013 Illinois Chapter of the American Society of Landscape Architects Merit Award for "Waterline" in collaboration with SOM, Friends of the Chicago River, and Spirit of Space.